Out2Gettem Bowfishing is licensed and insured with the United States Coast Guard and alongside of Captain Andy who has been doing charters for the past 6 years. Captain Andy Will meet the customer at discussed location in Belle Chasse, Louisiana. Charters launch at dusk and last 4/5 hours – unless limit is shot. No deck hand will be provided for Mud Boat Charters. All bowfishing equipment will be provided. Right and left handed bows are available. Recommend age for children 10 years and older; but a discretion of the customer 17 and younger, must be accompanied by an adult 21 years and older. When you mix your passion for fishing and also the thrill of shooting arrows, you will see why such a big amount of anglers get pleasure from the game of bowfishing. The fast target acquisition paired with the short unharness of a cord to send an arrow through the water and into a fish offers a satisfying thrill that keeps bowfishers coming for additional. 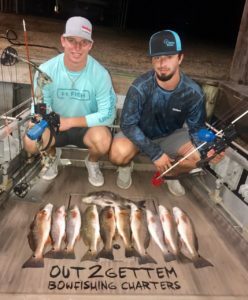 Whether or not it’s red fish, carp, alligator gar, or alternative fish species, Out2gettem Bowfishing Charters has all the required equipment for bowfishing to make sure you are well-prepared to tear through the water.